Æon Flux and Trevor Goodchild are lovers who play on opposite sides. In mythology, Alastor is the male counterpart to Nemesis. Peter Chung created Æon Flux with Gnosticism, in mind. I show the Pleroma of Valentinus, on top of the Æon Flux cover, and you can see the dueling pairs. What I see is a model of group dynamics; a yin-yang roundtable. Feminism is insane because Feminists spit different messages. Many Feminists call themselves Humanists, but fail to examine the male perspective. In my opinion, any son raised by a proclaimed Feminist is suffering mental cruelty. The image above depicts Humanism—acceptance of opposition. Catholics wanted to deny rights of individuality in their doctrine. If you turn the names into tribal groups; you will see why I call this a model of group dynamics. I’m not preaching a religious system, in this post, I just see this as a balance Philosophy. When Constantine made Christianity the religion of his Empire; he made changes to suit his needs. Did Jesus preach this philosophy of balance and did the Pope of Constantine’s Empire erase this system? I don’t know, but I see the possibility. Would Feminists be insane if they accepted this philosophy of balance? I said Feminists—not women and I truly mean my insult, because a Feminist is not a Humanist. Pleroma of Valentinus comes from Wikimedia. Nemesis is the goddess of others; she is the third law of motion. Newton’s third law of motion the one that denotes an equal but opposite reaction accompanies each action. The media glorifies the Pope and I say shove it. Nemesis hates pride and zealots burn with pride. Pope Francis named a zealot a saint. Zealots serve Lucifer. Either the Pope does not believe in hell not god or he’s going to burn. I’m still working on one aspect in my novel. Feminists often turn men into the others, so Nemesis fights on the guy side. Nemesis is a trickster; she shifts sides. Nemesis serves balance, like Mother Nature. Saint George symbolizes order and the dragon represents chaos, but who should you root for? Dictators want order; they want control. The Shah of Iran wants conformity to his version of Islam; the Inquisitors of the Catholic Church also enforced order and conformity. The creators of Nemesis the Warlock named their villain, Torquemada, after the real-life Grand Inquisitor. I alluded o him as Torque, in my chapter in rewrite. I use the Greek goddess, Nemesis, rather than the creature from the graphic novel; I didn’t even know about this comic book. Shared roots of inspiration probably explain this coincidence. Pat Mills and artist Kevin O’Neill created Nemesis the Warlock. The image on the right is Paolo Uccello’s depiction of Saint George and the Dragon, from Wikipedia. I enhanced the color on both images because small images often need a boost. The phrase Novus ordo seclorum Latin for “New order of the ages” is on the back of the US dollar and the back of the Great Seal of the United States. magnus ab integro saeclorum nascitur ordo. The great order of the ages is born anew. Iam redit et virgo, redeunt Saturnia regna: Now, Virgo (Lady Justice / Astraea) returns, thus returns Saturn’s reign. iam nova progenies caelo delabitur alto. Now, a new age of man descends from the heavens. I’m back rewriting the scene containing Nemesis (Lady Justice, Virgo+Libra, Astraea). I can go on and on with names, but this myth dates back to when Inanna stole the rule (the Mes) from Enki. The astrological signs Virgo and Libra factor into this myth. Nemesis, the goddess, is the nemesis of pride (Satan); she brings balance. Who judges you? Famine comes both from weather and man. Capitalism as a cure for famine seems odd, but look up famine in Wikipedia to see how they explain it. Incentive is a form of hope; everyone needs a carrot (hit the carrot link if the carrot link if you don’t recognize the idiom). Adam Smith’s Wealth of Nations gave birth to the American economic engine. Greed is an Invisible Hand which can save or crush the human spirit; you need balance. I read today 1 in 30 children in the US are homeless. We have a growing wealth disparity, as we turn into a Catholic country. Why does Catholicism produce such an effect? Because they have a vertically tiered system from which white robes drop alms to the poor. Tokenism does not work. People need purpose and reward. Trickle down systems fail as the Clintons say, but they had a trickle out policy which shipped jobs away. I’m from blue-collar roots and made my living from manufacturing, but those jobs trickled out. Republicans and Democrats have sold out the American people. When how hard or no matter how well work has no meaning people get dispirited. People registered as Republicans or Democrats are traitors because both parties serve themselves. Gabriel García Márquez pokes fun at the constant switch from Catholicism to Communist atheism in his novel, One Hundred Years of Solitude. He describes the Catholics destroying the Churches and the Communists rebuilding them. Capitalism offers different dangers, but the correct balance can offer rewards. Once again, I say Protestant is not a religion; it is many religions which requires a balance in power. Catholicism has the vertical structure of a dictatorship. Most Protestants vote for their leaders; whereas, the Vatican assigns leaders from afar. Robots may make socialism work. Socialist theory is not evil, but it turns people into robots and people do not perform well as robots. Balance is the key. Nemesis, the goddess, is the enemy of pride and Satan represents pride. Salvador Dali shows a dog in his Metamorphosis of Narcissus; which, I can see as a symbol of famine. I do not know Dali’s intention, but I offer an interpretation. Pride and greed are kin and both need balance; they need – Nemesis. I use symbols and allusions in my writing, so the trivia in my novel does not make my work trivial. My mind works in hyperlinks and I get by with fuzzy logic and memory circuits, so my style has limits but I’m different. 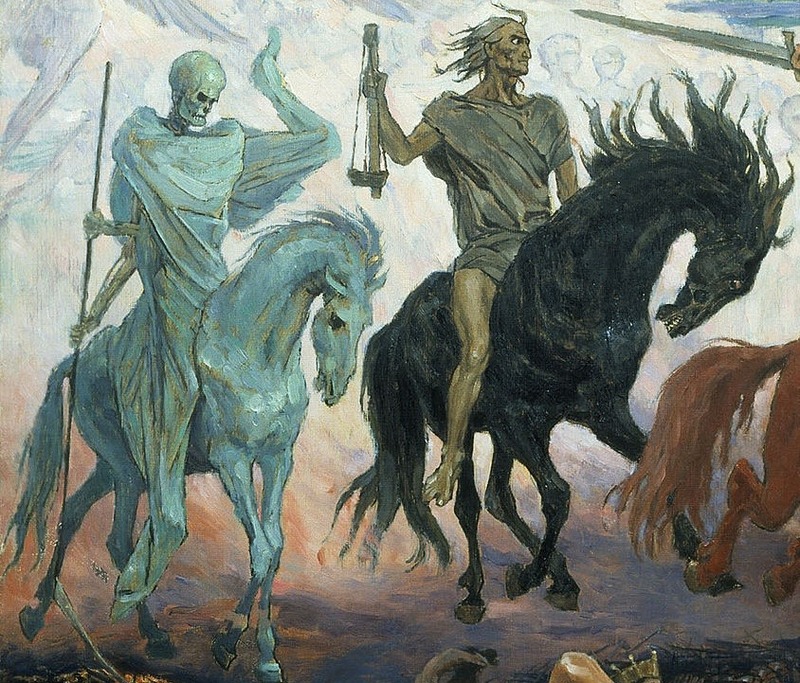 Four Horsemen of the Apocalypse, – Conquest, War, Famine & Death, an 1887 painting by Victor Vasnetsov. The Lamb is visible at the top. Four Horsemen of Apocalypse, by Viktor Vasnetsov. Painted in 1887. Apollo I has a shape close enough to the Mayan sacrificial altars that led me to draw a parallel to types of sacrifice. 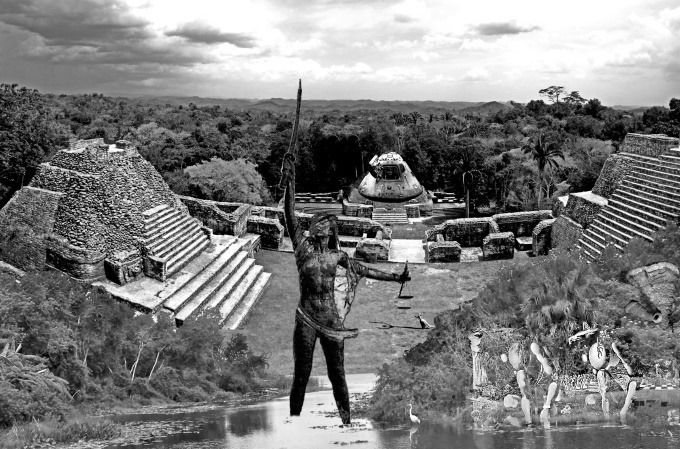 Mayans thought human sacrifice was for the good of man. They believed in the “sacrifice to seed.” Death brings forth more life. The men of Apollo I sacrificed their lives for the benefit of mankind. No guarantees were given that the space program would provide future benefit. When does sacrifice pay off? Is nature the nemesis or our own nature. The female figure in front represents Nemesis, the goddess. I added images from Dali’s “Metamorphosis of Narcissus” and “Morphological Echo“ to the “Panorama atop Caracol” all from Wikimedia. The sponge from my last post also appears behind the chess board. I had a more surrealistic and modern picture in my head, but this was easier to make. I don’t have every element here and I have some scaling problems. I imagine a few things going on, off to the right. The scales of Nemesis should hove above a crowd of people, but I have too many limits to my talent. Chaos rules in mythology. Deities change names and shuffle properties with each era and region. Nemesis, the goddess, is also part Lady Justice and Fortuna plus she is ascribed as mother of the Telchines, who are also the Cabeiri. You will also have people like me telling you that Hephaestus is a water deity and no one with some knowledge about Greek mythology will say such a thing but people willing to take another look may see my point. Where did Hephaestus grow up? You will not find Nemesis on the Parabiago plate but change a few symbol changes can make her fit. The Karpoi (the fruit) or what other names they may go by fall in the Little People who do all the work category. The Karpoi on the Parabiago plate are obviously agricultural deities. Use metallurgy symbols instead and they will move into the Telchine and Cabeiri territory. 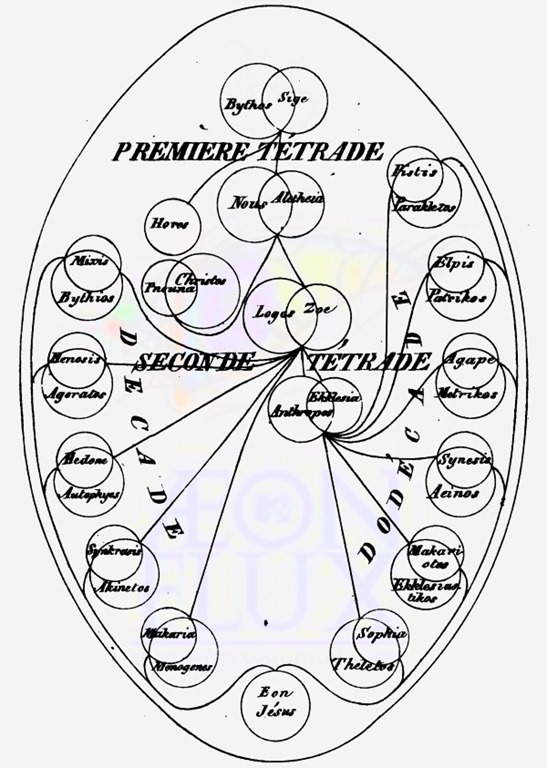 Tartarus was the Telchine father and Nemesis’ lover; he is also shares underworld deity status with Dis Pater. I typed in “Rich Father” with blue font because that is what Dis Pater translates to. 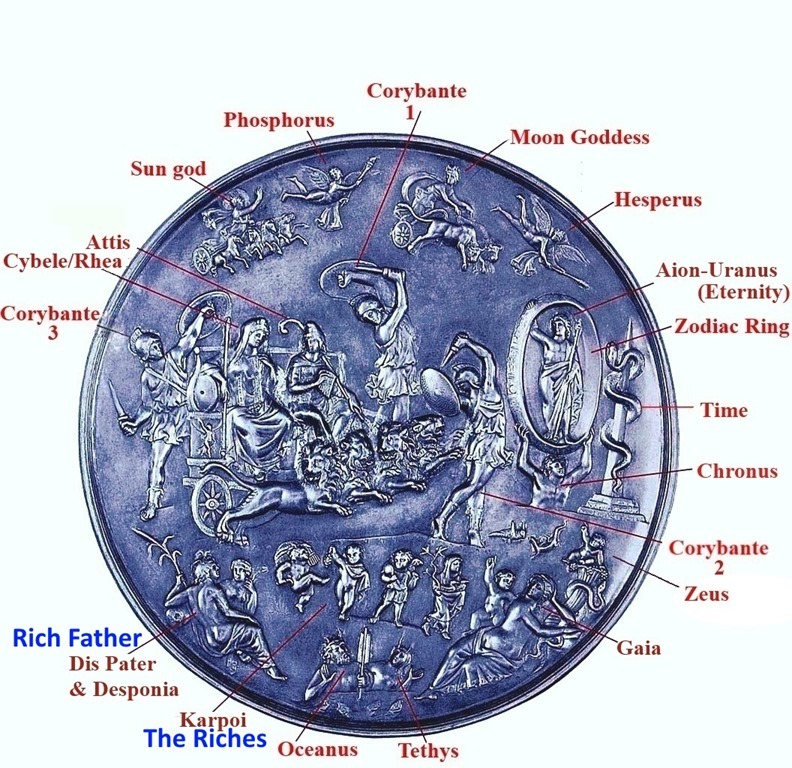 I also typed in, “The Riches” because foodstuffs, metals and minerals fall under the riches of the earth.Change symbols of the lovers on the lower left portion of the plate and you will also change the appropriate identity of those Little people. Oceanus still fits but Nyx (night) is most often described as the mother. Using Hephaestus in place of Oceanus and pair him with Cabeiro gives you a match that gave birth to the Cabeiri. The Hephaestus, as a water deity becomes a better fit. Hephaestus, the Cabeiri, and the Telchines share blacksmith tongs as a symbol which also links all three to the crab. My point being that these are symbols older than Greek mythology; they dip into the Babylonian era. These are very old symbols and were associated with the most significant gods. You may never have heard of the Cabeiri, but they one had major significance. Nemesis makes for a nice match with Innana. I haven’t even gone into the Leda and the Helen of Troy links in these mythologies. I’m probably going to need presentation software to get people to see some of the things I see and use in my novel For another day. Side note: Good for Miley Cyrus to use her celebrity status on something important. I’m sure Sister Marie Veronique agrees with some issues raised by Femen, as do I. Many may see some of my posts and see me as hating both Feminists and Catholics, but truth often comes with a complex story. I don’t believe a god (or goddess, if you prefer) needs people to kill other people and Catholics killed & persecuted people of other faiths for centuries (diminished power was the primary reason they stopped). Do nuns believe people should persecute people from other faiths? Am I the villain? My problem with Feminists is the mixed messages they send. I find some humor in the irrational messages, but annoyance does provoke some of my humor (and occasional rant). The charm of the Ten Commandments is the simplicity. If Feminists write their concerns in a simple respectful manner; then this inferior male, as they often imply, will act more as friend than nemesis. Many do not realize Feminists have many different ideologies, which would render even a brainwashed Superman incapable of compliance. Am I a villain for making such an observation about Feminism? Nemesis (the goddess) is related to Lady Justice and they are balance goddesses. Most do not recognize them as Trickster archetypes, but one primary feature of Tricksters is balance. Nemesis interests me because balance features in this present chapter in rewrite. I have another reason, for another post, but my main point is how your nemesis can play the role of friend. Nemesis sees good and evil as relative People persecuting heretics may see themselves as serving the greater good, but are they? The bible says pride caused Satan’s fall. In Greek mythology, Nemesis takes vengeance on pride. 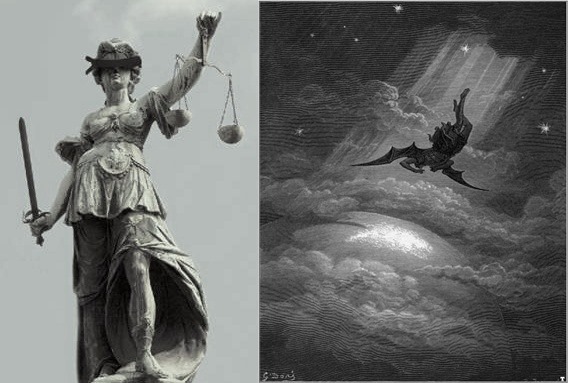 I show Lady Justice, but this blindfolded goddess came from the joint attributes of Tyche (Fortuna) and Nemesis. Maybe my mind ran some old info up when I decided to use this goddess (in my present chapter under rewrite) or it was blind luck. Reasoning did come in play because pride is only bad in excess; pride sits on scales..
Sons of Nemesis, Castor and Pollux, have ties to the saints, Peter and Paul. Some myths call Leda, the mother. Zeus, as a swan, did the fatherly deed. Helen of Troy is the ugly duckling born from this union, she also factors in my book. Of course, the Cabeiri play a larger role and the twins, turned constellation (Gemini) seem to have links to my little Mystery Cultists. What a tangled web – me weave (I write fiction and the game is to deceive even though I most often keep to the truth). 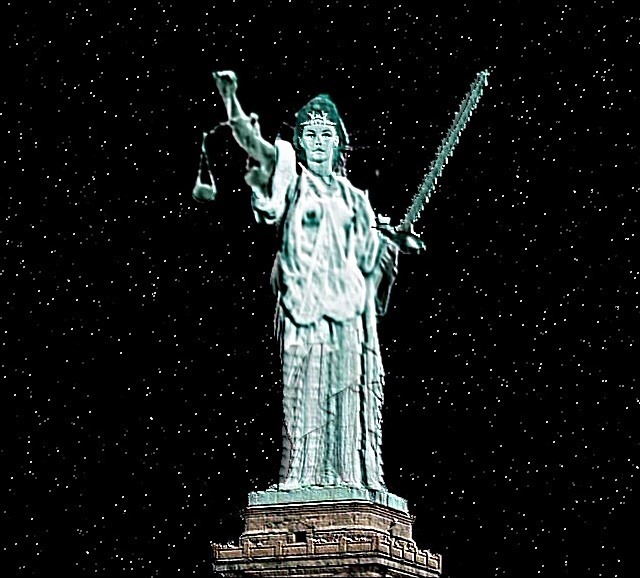 Why isn’t Lady Justice a comic book character? Gustave Doré’s illustration of Satan’s fall (right) from John Milton’s Paradise Lost.